The Samsung Galaxy S4 has a fairly complete package of intelligent features which are aimed at improving the user experience and facilitate interaction with the device. 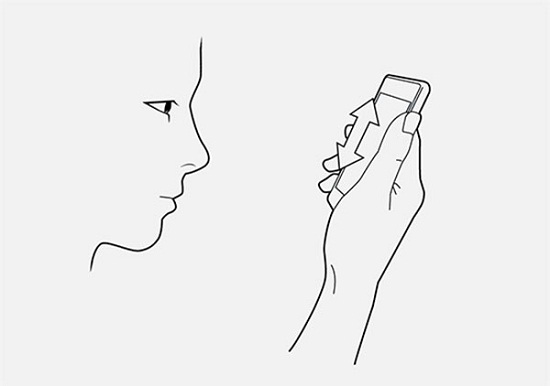 Among the whole package of features, there are several whose operation lies with the front camera, which is used to detect different gestures, head movements and thus perform certain actions. These features are called ” Smart “and we saw them a taste of the Samsung Galaxy S3 , but were extended with the Galaxy S4. Among them is Smart Pause, Smart Scroll, Smart and Stay Smart Rotation. ‘ll have what they are and how to use all the capabilities of facial recognition of the Samsung Galaxy S4. Functions Smart grouped in paragraph intelligent or Smart Screen Display menu settings , specifically within the device tab. The first option is to stay smart and stay smart, an old acquaintance of the Samsung Galaxy S3. When you activate this feature can be looking at a web page or reading a text at no time the screen turns off. By default there is a waiting time until the screen of a smartphone if you do not touch, hang a measure to prevent battery drain. 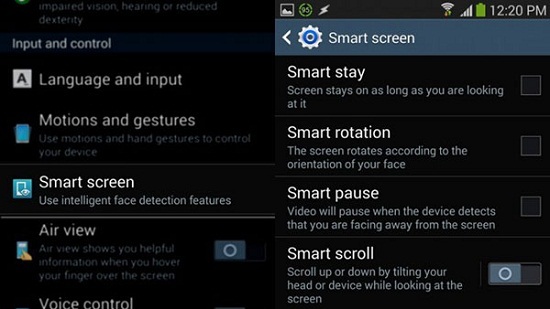 What makes Smart Stay is detect when we are looking at the screen to keep it on, but if you turn away the sight off. The next option is Smart rotation or smart rotation. In this case it does is lock the screen rotation based on the position of our head. Who has not done that is sailing with their smartphone while on the bed or couch and the screen continues to be in landscape mode . With Smart Rotation always maintain the correct orientation according to the position of our eyes. 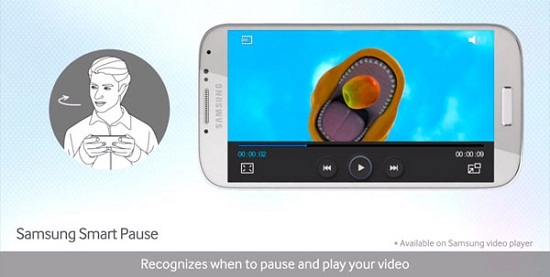 Smart pause or pause Smart is one of the most noted features in the launch of the Samsung Galaxy S4.Again the terminal detects your movements and gestures through the front camera, but in this case focuses on video playback . Imagine you are watching a video of the holiday and someone interrupts us to ask a question, it is normal that revolve head to assist you. With Smart rotation device that detects movement and automatically stops playing, and when we finish we will have lost none of the video. Finally is Smart Scroll , an interesting feature that is designed to not have to do the typical gesture scroll when we’re reading a long text. The terminal senses that have reached the end of the text and the screen goes down for us, and so if we look up. All Smart Functions package provides a new type of interaction with the device more intuitive, almost instinctive. Posts to seek a paste would be the battery consumption because it keeps the front looking camera connected gestures or movements.